2011 has been the most exciting year for the Blu-ray format thus far. Some of the most sought after catalogue titles have finally been, or are about to be, released - Star Wars, The Crow, Pulp Fiction, Taxi Driver, Scarface, Jurassic Park, The Lion King, just to name a few. These are surely some of the films that will help to define the year for most, but for me? I'm especially excited to see some of the best films of all time get the film-like restorations they deserved, not to mention the magnificent collector's packaging they've come in. Paramount presented us with a 6K restoration of The Ten Commandments in the first quarter, and it's easily the most impressive catalogue release to date (yes, even over you, The Wizard of Oz). Not to be outdone, Warner Bros. just gave us a masterful 4K restoration of Citizen Kane, and now no more than two weeks after the fact, Warner lands a follow-up hit for the knockout - With their own Charlton Heston epic, Ben-Hur, which also has been meticulously restored at 6K. The result? Warner's cell-by-cell restoration can only be described as 'wow', and should absolutely stand as the final nail in the 'old movies can't look better in high-def' debate. Honestly, if there's anyone that can view this release and walk away uttering such blasphemy, I may as well hang up my reviewer cap now. But, I'm getting ahead of myself. Ben-Hur: A Tale of the Christ is one of the most beloved literary classics of all time, and although it's seen numerous film iterations before (in 1907 and 1925, both of which were silent films), it was William Wyler's retelling in 1959 that really made 'Hur' a household name, and there's a host of reasons for that. The first of which being a story that's epic in both concept and scope - Judah Ben-Hur, a wealthy prince in Jerusalem, seemingly has it all. His people are kind to him, and in turn, he's kind to his people. Not in a 'worship me or it's a thousand lashes' kind of way, but he genuinely treats the people who serve him as equals, friends even. However, things change when Judah is visited by Messala, an old friend that now serves the Roman empire as a military tribune. The two get along swimmingly just as if old times were upon them, but it isn't long before Messala lays out a terrifying ultimatum: Judah must tell his people to roll over and be conquered, and if he doesn't, then Rome will take it by force. Judah insists he will do no such thing, and the two part ways. As promised, Rome's military marches into Judea with the understanding that their presence isn't welcome. Watching Judea's takeover from a roof top, a roof tile slips and strikes the governor appointed by Rome. Although Messala knows Judah is against violence and would never stoop low enough for such a stunt, he sees the situation as an opportunity. By turning on an old friend and his family, he could make the people of Judea fear him, so he promptly condemns Judah to the galleys and imprisons his mother and sister. Judah vows to one day return and have his vengeance. If not for the kindness of a robed stranger before his departure to sea, Judah would have lost the will to live. But because a single man showed Judah that there was still hope in a world gone mad, Judah remained strong over the next three years, despite spending every waking moment as a slave that rowed ships for the Roman empire. Eventually an opportunity presents itself, allowing Judah to save the life of Quintus, a Roman nobleman that grants Judah his freedom for the trouble. After forming a close bond with Quintus, Judah is adopted and recognized as a friend to Rome. With freedom and power once again in his grasp, he barges his way into Messala's quarters and presents him with an ultimatum - Find his family, and find them alive... or else. Thus begins the final stages of Judah's quest for revenge. It's a very interesting plot and its execution is equally impressive. This film is properly able to juggle character development with cautiously precise pacing, all while exploring thematic elements of love, hate, vengeance, redemption, faith, and forgiveness. The circumstances that wrap all these thematic ideas into a nearly flawless package only help to accentuate the epic scope of the tale, as we bear witness to complex battles on the ocean, an exciting yet dangerous chariot race (which seems dangerously real even for today's standards), and we even get to witness the impact of Jesus' life on Earth through Judah's encounters with him. For a time in cinematic history that had to rely solely on practical effects or optical illusions, undertaking the scope of such events seemed to be a foolish effort from a financial standpoint... but that was a risk that MGM was willing to take. You see, the studio was staring down the money barrel at bankruptcy, and felt as if they needed to place all their chips on the table in order to stay relevant or perhaps at least go out with a bang. So, MGM spent $15 million dollars on the entire production, a price tag that was unheard of in the 50's (The Ten Commandments is estimated to have only reached $13.5). The gamble paid off though, as every penny was utilized to help make all the events and locations of Ben-Hur seem as real as possible - 300 sets were built over 340 acres of land (with 1 million props), up to 15,000 extras were used at a time (as well as some dummies that were strategically placed about), there was a total of 100,000 costumes, and the practical effects (such as the battle at sea) were impressive enough to not be dismissed as toys at play on the big screen. After all was said and done, MGM initially saw a return of $17.5 million at the box office and up to $90 million to date, and brought home 11 Academy Awards. Even still, money isn't everything. So many thematic ideas and impressive set designs could never make a film that's nearly 4 hours in length interesting without the proper cast to captivate an audience. 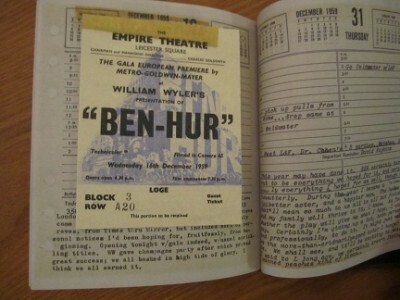 Fortunately for Ben-Hur, every single member of the cast was played to perfection. Charlton Heston was well established enough at the time, having taken part in a historical epic just a few short years before this film's release, so audiences undoubtedly went into this film hoping to get the same quality performance yet again. Heston certainly doesn't disappoint, as he commands the screen every moment he's on it. It doesn't matter if he's talking to an old friend, writhing in emotional agony, or unleashing a torrent of anger when he speaks - Heston isn't just an actor on the screen. He is Ben-Hur. Every supporting cast member deserves honorable mention for not appearing as if they're out of their league when next to Heston, but make no doubt about it, Heston's portrayal of Ben-Hur is the most memorable performance not just of his career, but of all time. He knew it, too, and ended his career in 2003 by releasing an animated version of Ben-Hur, where he reprised his role as Judah once more. If you've seen this film before and don't agree with the fact that this is one of the better performances from an actor ever committed to celluloid, then this is perhaps the perfect time for you to revisit the film. After all, Judah isn't as one dimensional as some of the other roles that Heston can be noted for in his career. No, Judah is a peaceful man that's filled with love and kindness, yet due to the circumstances that work against him, he slowly transforms into a hate-filled person that's obsessed with little more than revenge... and it's believable. Sure, Heston can go a little over the top at times, but that's part of the charm of his portrayal. Anyway, although I can't name everyone else from the cast that deserves to be, I would like to recognize Stephen Boyd for his portrayal of Messala. He really did a better job at making me believe he was a real villain, as opposed to the over acted ones that almost seem like cartoon caricatures. As a result, I felt like I got to know the man and what he was about, and more importantly, I grew to hate him with every fiber of my being. In most films when a villain is established as such, I slap a little label on him and tell myself, "OK, he's the bad guy." To make me actually loathe a villain in a film as much as this however? I really have to tip my hat to Boyd, and thank him for making Judah's turn from kind prince to blind vengeance that much more believable. Personally, I went a really long time in my life without paying any attention to the likes of The Ten Commandments or Ben-Hur, as I thought them to be religious films and honestly, I'm not exactly the religious type. That being said, when I did decide to put my bias aside and give them a try, I fell in love. There's so much to appreciate in Ben-Hur. Because of the massive set designs, insane amount of extras and wardrobe, and the finest details paid to the practical effects in the film, Ben-Hur is impressively immersive for a film that's 50 years old. Despite a runtime that one would expect to make a film feel like it's dragging on forever, Ben-Hur is engaging from beginning to end for all of the reasons I've praised above. Even when the film isn't being 'busy' with a confrontation or action or anything else 'exciting', the character development is done well enough to ensure things move along at a nice clip. More importantly, Ben-Hur also seems to have quite a bit of replay value to it. I've seen it before, and now I've seen it again (for what seems like the first time thanks to the restoration on this disc, but we'll get to that in a minute)... yet I already feel like I want to schedule a little time to give it yet another screening. I don't care if you're 20 and have some kind of disposition that makes you think a film from the 1950's can't be good, or if you're 60 and have seen this film 15 times... Ben-Hur is a timeless classic and one that I personally believe can be enjoyed by most everyone. If you've been hesitant because of its age, don't be. When people praise films as being timeless, this is the kind of film they're talking about. If you've been hesitant because of a possible religious element at play, don't worry. The religious aspects aren't so in your face they're preachy. Trust me, put these typical (yet understandable) concerns aside and see what you've been missing. For many of you, I'm sure this is the part of the review you're most curious about. Although the previous DVD release looked good, has the 6K restoration (from an 8K source) really served this film justice, being superior in high-definition in every perceivable way? Oh boy, is it. Ben-Hur's 1080p AVC encoded transfer (2.76:1) is the most astonishing catalogue title I've ever seen. As I said at the beginning of the review - Anybody out there that still clings such ignorant claims as 'old things can't look any better in HD' should watch this Blu-ray and educate themselves in what film looks like, no matter the era it came from. 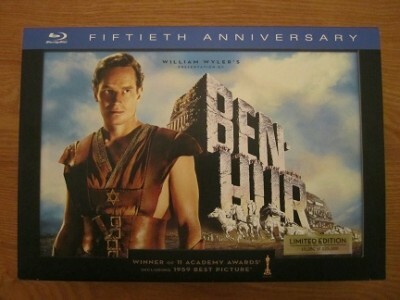 Yes, make no mistake about it, folks - Ben-Hur is the best looking release of 2011. Before I highlight the positives here, yes, I know that picture quality is something that can only be defined by the viewer. Some people only consider the likes of Avatar to be worthy of such an honor, and I guess I can understand that... but Ben-Hur is likely to astonish film enthusiasts and casual home theater enthusiasts alike. For starters, the grain haters out there (why, oh why do grain haters even exist?) will worry first and foremost that Ben-Hur is plastered in an ugly coating of grain (despite the fact that grain is actually what the image is made of). That particular camp has nothing to fear with this release however, because Ben-Hur is a clean presentation through and through. Scratches and dirt are virtually non-existent, and the grain composition is light - Natural and very film like... which will also please the die-hard film preservationists out there. That's right - NO DNR! As a result, we can see every blade of grass that's reasonably close enough to see, every strand of hair on a person's head, threading in clothes, skin texture, everything. If any of you out there have already seen The Ten Commandments earlier this year, then you pretty much know what you can expect here, as Ben-Hur is just as brilliantly restored and in my opinion, even ups the ante a little. Everything is as defined as life itself without the 'aid' of edge enhancement. Furthermore, no detail has been lost due to compression artifacting. 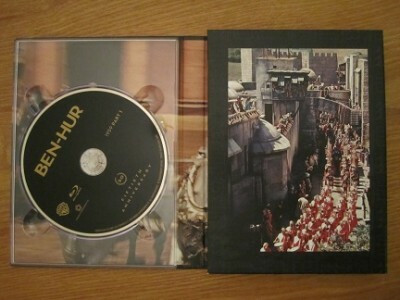 Due to the fact that Ben-Hur is nearly four hours in length, the film was split onto two Blu-ray discs to best preserve the look of the film. Another worry some casual moviegoers out there might have is that a 50 year old film must look drab and lifeless. No so. Even though the film's original 65mm master was in poor condition, Warner's cell-by-cell film restoration process has brought life back into the film in a very big way. 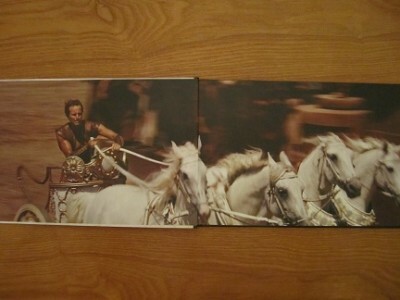 The previous DVD's of Ben-Hur had some trouble accurately displaying reds - At first in 2001, reds were sort of drab and even drifted a little closer to orange at times. In the more recent 4 disc set that was released in 2005, reds were corrected but overly so, and often had a tendency to bleed. For this Blu-ray, reds are very strong as they should be and do not appear to bleed. For that matter, all of the color in this film pops if it's supposed to, and the scenic shots are natural and lifelike. Same goes for skin tones. Factor in the fantastic contrast and black levels on this disc, and we're looking at a film that almost appears to have been shot in more recent years. 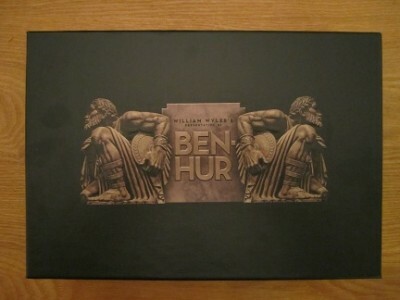 Film enthusiasts everywhere have need to rejoice - There are so many titles (Warner Bros. typically a nasty offender here) that are a given a swift kick in the pants just so they can be pushed onto retail shelves... but Ben-Hur is exactly what film enthusiasts crave. The image has been faithfully preserved to retain natural grain structure, while also faithfully reproducing every last detail and color to perfection. I honestly wouldn't be surprised if this film looks better than it did during its theatrical debut. Not only does everything look immaculate up close and personal, but details in the distance look just as good as if you were looking out a window. There only minor caveats to this release is that there are a couple of mis-cuts along the way, causing the image to 'jump' as if a few frames were missing (the first time you'll notice this is when Judah is talking to Quintus in his private quarters). Don't worry, this doesn't affect the sync between audio and video. However, considering how pristine the rest of the restoration process is, it's easy to overlook. There are a few shots throughout the film which are slightly softer than the rest of the film, but this is a result of the way it was shot. I don't think I've ever written so much for a video portion of a review, but Ben-Hur deserves every word. Simply put, this release is a no brainer in terms of upgrading from your old DVD, as Ben-Hur's debut in high-def is reference quality that every catalogue title should strive to achieve. Unsurprisingly, the 5.1 DTS-HD Master Audio track also achieves perfection. The previous DVD's, although sounding quite good, didn't exactly sound natural. Sound effects were a little loud for the track, probably just for the sake of being so. The same can be said for the score, which to my ears sounded like it was a little harsh at its peak moments. This has been rectified for this Blu-ray release, as the sound effects sound natural and 'fit' better in the overall sound design, and the score now sounds majestic instead of just noisy. Dialogue is always clean and crisp, and never sounds tinny. A good chunk of the track overall comes through the front speakers, and the most sound envelopment you get for the most part is hearing dialogue fade from left to right. There are some sound effects that come from the rears for ambience though, which completely took me by surprise for a film that's 50+ years, and they actually don't sound 'tacked on'. They too, sound natural. The entire sound stage actually gets rather rowdy during the sea battle and chariot scenes though, and you'll be impressed just by how immersive those scenes can be. Honestly, any and all of the faults that can be found in the sound design is just that, a fault of the sound design (most likely of the time). However, this is the most faithful representation of Ben-Hur I've ever heard, and is likely to be the best we'll ever hear. More top notch marks for a stunning release! -Commentary by T. Gene Hatcher with Charlton Heston - This is a little different than most commentary tracks we've accustomed to listening to, as Hatcher and Heston were recorded separately. Heston provides commentary for nearly a third of the film in bits and pieces, whereas film historian Hatcher fills in the rest of the time frame. Although you'd expect the commentary to be dry since the two people involved weren't in the same room to bounce off of one another, this couldn't be further from the truth. Heston remembers many details about his time filming Ben-Hur and is able to provide discussion that has a wealth of information and just as much as heart. Hatcher is very knowledgeable about the film and provides a very factual, yet thoughtful account in regards to the history of Ben-Hur and its production. It's a long movie, and a lengthy track (as it's continued on disc 2), but if you've seen this movie numerous times, you'd be doing yourself a disservice by not listening to what these guys have to say, especially Heston. This really feels more like history than a commentary! -Charlton Heston & Ben-Hur: A Personal Journey - This is an all new, feature length documentary in HD that chronicles Heston's life while filming the cinema changing Ben-Hur. Although making-of supplements have been made available on previous DVD releases, this is a much more personal look at what goes on behind the scenes, through the eyes of a film star and even his family. Not only does this documentary feature a great wealth of behind-the-scenes material, but it also includes some of Heston's personal home movies in the mix as well. This is truly an important addition to the set that almost makes the price of this boxed set worth the money alone, as it's truly any film historians dream come true. -Ben-Hur: The Epic That Changed Cinema - This documentary appeared on the 2005 DVD release, and no expense seemed to spared in order to deliver the goods. Contained within are interviews with Wyler and Heston, as well as some modern day filmmakers (Ridley Scott and George Lucas good enough for ya?) and fans of the film alike. Whereas the previous documentary really goes as 'behind the scenes' as you can get, this one reflects mostly on the impact Ben-Hur had on cinema as a whole. -Ben-Hur: The Making of an Epic - Pretty much anything that wasn't mentioned in the detailed commentary or documentaries listed above is included here. This supplement details the path the story took from novelization (1880), to stage productions, to silent films (1907 and 1925), to the 1959 epic featuring Heston. Interviews, behind-the-scenes footage and interviews with members of the cast and crew that were on the scene are all included here. Consider this an 'overall' look at Ben-Hur's history through expressions and art. 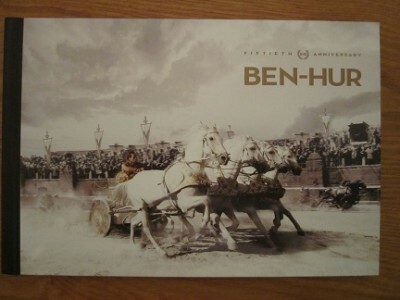 -Ben-Hur: A Journey Through Pictures - This is pretty much just a still gallery in motion, but it's worth taking a look at all the promo material that's here. This Blu-ray boxed set is seemingly very much geared towards those with an interest in cinematic history, so this shouldn't disappoint. -Ben-Hur 1925 Version - Finally out of the 'behind the scenes' sub-menu, we come to the silent film that preceded Wyler's epic by 34 years. At nearly two and a half hours in length, the silent picture is interesting to see, although I admit it's not a style that I can really sit through entirely. What I did see was fairly impressive though - There were many more extras than I would have anticipated for a film this age, making the amount of costumes to be seen rather astonishing, and the picture quality is quite good considering. But, the rest is fairly typical for silent films of the era - Most of the physical acting and emoting are absolutely dreadful. Over-acted and almost comical to see, this really does destroy the epic-ness that this story deserved. I guess in 1925 though, you didn't have much choice! Still though, again, this is a great piece for such a historical collection contained within a box. This sub-menu features a lot of content that's pretty much self-explanatory by name alone, and further enforce the idea that this boxed set is more of a time capsule than some waste of space retail brick. 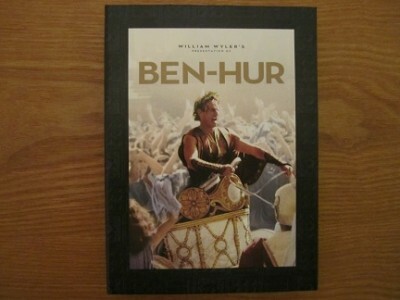 -Ben-Hur 50th Anniversary (Hardcover Book) - This book is absolutely gorgeous. The pages are glossy, shiny and smooth, and provides a general overview of the film through a minimal amount of words and gorgeous photos, both black and white and color. 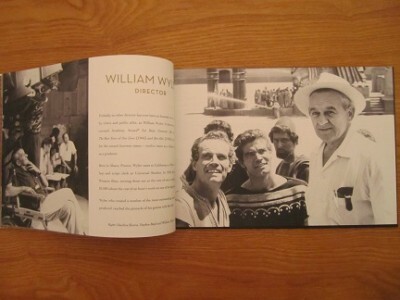 After a brief introduction, the book covers and pays tribute to the main cast and director, and goes over such topics as The Tale of the Christ, The Friendship and Conflict, The Romance, Galley Slave and Ocean Battle, Rome, The Chariot Race, Valley of the Dead, The Crucifixion, Wardrobe, Sets and Props, Behind the Scenes, Advertising/Publicity and Awards, and finished off with numerous pages of newspaper clippings related to the film and its production. 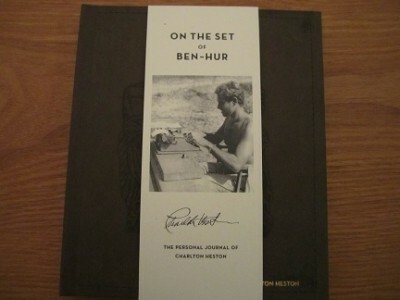 -On the Set of Ben-Hur: The Personal Journal of Charlton Heston - After a brief introduction from Fraser Heston (written in 2011 for this Blu-ray release), the rest of the book is exactly as advertised - It is the personal journal of Charlton Heston. The pages are cheaper to the touch than that of the 50th Anniversary book, but this is by design. The people behind this Blu-ray set were seemingly going for authenticity, and authenticity is what they've accomplished. 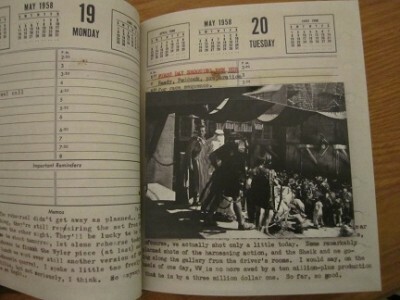 Each page of the journal has a calendar date up top with some room to write some notes, but most of the 'writing' in Heston's journal was seemingly typed. 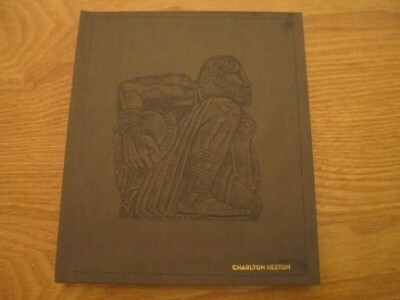 This doesn't ruin the authenticity however, as this seems to be the way Heston entered things in his journal. The text actually looks like it was typed by a typewriter and not printed by a computer, and there's also color added to the pages, such as if something was underlined in red, and there's even some notes that have been hand-written by pencil. There's even a couple of photo-cards inside, meant to emulate when Heston taped a picture in his journal. This is probably the nicest collectible I've ever seen in a boxed set that actually had some sort of relevance to it, and anyone who's a fan of this film, Charlton Heston, or just film history in general, shouldn't be without this book. Often times boxed sets are passed over by some who only want to have the film and 'not a bunch of useless junk'... but this boxed set is different. Contained within are supplemental features and documentaries that chronicle the film from inception to its influence on modern filmmaking, acting as a true cinematic time capsule for one of the most beloved films of all time. Add to that the personal diary of Charlton Heston that's included, and this really ends up being a package that nobody should live without. Oh, and there's that minor little detail that this is the BEST looking catalogue title ever released to the format, thanks to Warner's painstaking cell-by-cell restoration. Although I'm kind of desperate to make more shelf space every so often and really don't care for humongous boxed sets, I'm proud to own this release and will display it proudly. Easily the best DVDTalk Collectors Series rating I've ever given. For those of you that are planning on waiting for a 'closer to bare-bones' release, I sincerely hope you reconsider, because this set isn't just a space waster.